In a digital invitation sent out to US-based media this morning, Apple confirmed that it will hold a special event on September 12 to introduce new products and services. 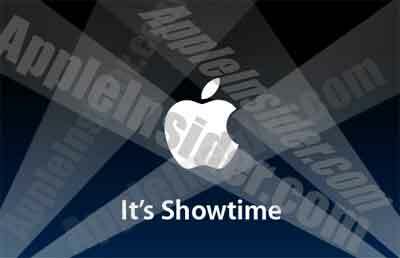 "It's Showtime," reads the invite, which displays a two-dimensional white Apple logo swept by four crisscrossing Hollywood movie premiere spotlights on a navy blue background. The event is scheduled for 10:00 am local time at the Yerba Buena Center for the Arts Theater in San Francisco, Calif.